Last Sunday we went to Mishima for shopping all together. I think the last time which I went to Mishima with my family was 2 years ago. 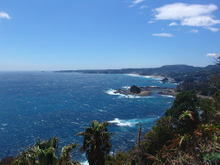 This is a picture over looking Shirahama, which I took at Ogasaki Wing, the entrance of Shimoda city. It was sunny and gorgeous day, but we had strong wind. So we could see the white waves over there. This entry was posted in Flower, nature, Sea, Travel on 2008年4月22日 by izusakuraya. In these days the weather is changing day after day. So it is difficult to know the weather of tomorrow. This morning it was sunny here in Shirahama but it became cloudy after around noon. However I could see Izu seven island over that ocean clearly. But they had a little good wave there were many surfers getting in the water……. 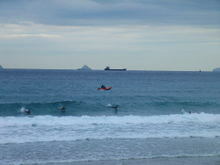 This entry was posted in beach on 2008年4月19日 by izusakuraya. In Izu peninsula there are many places which have Onsen ( Hot Spring ). 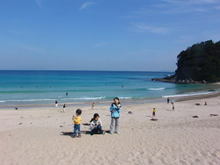 Shimoda is also very famous for Onsen. If you come to Shimoda by train you find big palm trees in front of the station building. 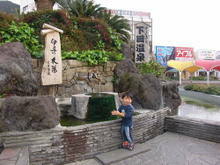 And you can touch the natural hot spring like my son Yuuki under the trees. "How is the water, Yuuki?" " Too hot, dad! " This entry was posted in Travel on 2008年4月16日 by izusakuraya. 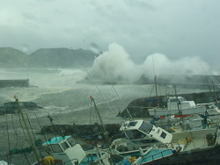 It was huge storm, almost typhoon in Shimoda! It started to rain last night and came to Shimoda with strong wind. My daughter didn’t have classes of the school today because of this strong storm. It seemed like a movie the big wave coming over that protection from the wave. I show you the picture of this port, which I took under the sunshine……. This entry was posted in nature on 2008年4月8日 by izusakuraya. Today it was very warm here in Shirahama. So I went to the beach with my children. Before that, we went to "Family Mart" near the beach to buy ice cream and ate it on the beach. There were some surfers in the water but they don’t have good wave today. I show you the water of Shirahama beach ……. This entry was posted in beach, Family on 2008年4月5日 by izusakuraya. Blue Sky and Blue Sea came back again! Yesterday it was rainny and the sea was grey, but the blue sky and blue sea came back again today. 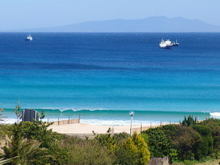 When I went to Shimoda I took this picture on the way to the beach. "I don’t want to live in the big city. I love the beautiful sea like this! ", my daughter said today…. This entry was posted in beach on 2008年4月1日 by izusakuraya.